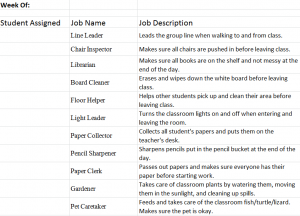 The Primary Student Classroom Jobs template is an easy Excel file for teachers K-6 to assign and post student jobs. Download and print these templates to fill in student names and post their jobs weekly. Download the Excel file using the link below for this one page template. This is a simple text black and white template that you can customize to fit your classroom needs or use as-is. The top has an area to fill in the date for the week this is being used. The first column is where you can type or write a student’s name next to their job. The jobs listed are common, generic classroom roles that students can fill to teach them about responsibility. Each job listed requires at least one daily task for the student to perform unprompted by the teacher. They are designed to engage the student to be pro-active, alert, and able to focus. To customize the document, simply add, delete, or change any jobs listed by typing in the Excel cells. You can make the descriptions simpler for younger grades to read, or add additional responsibilities. Use Excel’s text color and text highlighter to color code the sheet. Some jobs may require two people if the classroom has a lot of students. You can copy and paste the row to have it listed twice, or just put two student names in the cell. You can add a “Substitute” job at the bottom for a student to be in charge of something if another student is absent. Print and post this sheet in the classroom each week so students will know their jobs on Monday.